Smile brightly with our 2017 Jeep Wrangler Unlimited Sport 4X4 is bold and able-bodied in Billet Silver Metallic Clear Coat! Powered by a proven 3.6 Liter V6 offering 285hp and 260lb-ft of torque for outstanding low-speed crawling capability while connected to a 5 Speed Automatic transmission. Our trail-rated tough Four Wheel Drive SUV offers legendary traction, ground clearance, and maneuverability that makes your most adventurous dreams come true while offering near 21mpg on the highway. The embodiment of confident capability, our Jeep Wrangler Unlimited Sport boasts rugged good looks with skid plates, tough looking wheels, and fog lights. It's a fantastic blend of a modern design classic Jeep styling. Imagine yourself behind the wheel of our four-door, five-seat SUV that features full metal doors with roll-up windows, steering wheel mounted audio controls, cloth seats with adjustable head restraints, and a terrific sound system with CD player and auxiliary audio jack. With just one look or our Unlimited Sport, it's clear this machine can take some serious punishment and lets you dominate on and off the road! With Jeep, as you're blazing trails, bashing boulders, or cruising the beach, enjoy peace of mind that your Jeep is engineered tough with anti-lock disc brakes, traction/stability control, front airbags and hill start assist to keep you out of harm's way. 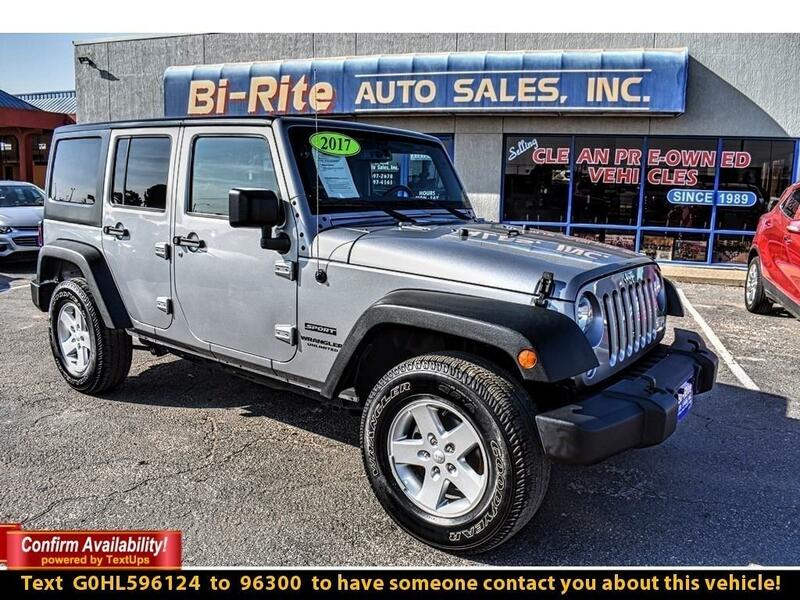 It's time to reward yourself with this tremendously capable SUV! Print this page and call us Now... We Know You Will Enjoy Your Test Drive Towards Ownership! Please call us for more information. Message: Thought you might be interested in this 2017 Jeep Wrangler Unlimited.